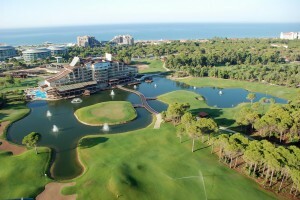 Belek and Antalya golf holidays are the most popular in Turkey and are a welcome addition to the golfing experience. Turkey has invested heavily in golf course design and is now a true golf destination. With high quality hotels and courses it has captured the imagination of golfers throughout Europe. 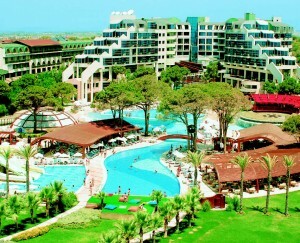 List Turkey as one of your next golf breaks, you will not be disappointed. Without a doubt the next ‘must visit’ destination on your golf break wish list should be Antalya on the Mediterranean Coast in South-Western Turkey. This golfing paradise is a gem along the Turkish Riviera. A golfers paradise, it boasts many luxurious hotels and fantastic golf courses. These are all located in close proximity to one another meaning transfer times are kept to a minimum. Belek and Antalya golf holidays offer some great options for you to choose from depending on your preference, if you are a golfing group or a family looking for a nice break Antalya has it all. Whichever hotel you choose from the various options we provide we are more than confident you will thoroughly enjoy it. 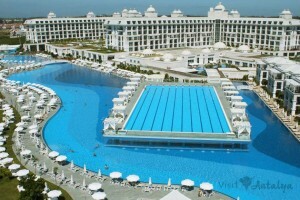 These are hotels such as the Sueno Resort, the Sirene Belek, the Cornelia De Luxe and Diamond Resorts, the Kaya Belek and Palazzo, the Gloria’s Verde, Golf & Serenity, the Kempinksi, the Voyage, the >Maxx Royal and the Carya Regnum Luxury Resort. These all offer a slightly different atmosphere and we can advise to suit your needs, the common theme will be quality. With over a dozen golf courses to choose from, all of which are manicured to the highest levels, you will not get bored playing golf in Antalya. There is a fantastic mix of championship golf courses such as Carya, PGA Sultan, National, Faldo, Sueno Pines, Lykia Links and the Montgomerie Course (home to the Turkish Airlines Open) to name a few. There are also many other top quality courses such as the Pasha GC, Kaya Eagles, Sueno Dunes, Tat and the Gloria Courses. Cornelia De Luxe Resort is located at a point where the unique spotlessly clean and shining sea of the Mediterranean meets very green pine trees forests at an area of 65.000 m2 in Belek surrounded with the natural beauties. Upon the unusual architectural design of the structure, various expectations of our guests can be met at the highest-level. Beside the standard rooms, the service quality can be distinguished in the suites featuring unique, villas constructed with the connections to the swimming pool. 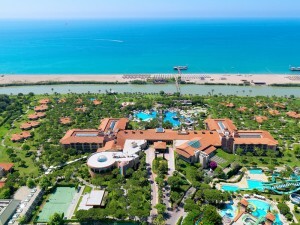 Cornelia Diamond Resort & Spa is located right across the beach of Iskele Mevkii which is a fine part of the glorious Belek Shore and is approximately 35 km. from the airport and 45 km. from Antalya city-center. 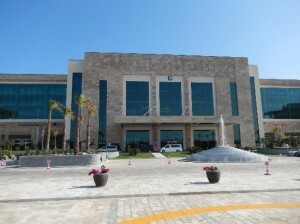 The Hotel Riu Kaya Palazzo (All Inclusive 24h) located in Belek, Turkey, has a 5-star service and a multitude of reasons that make it so special. Kempinski Hotel, the Dome is a luxurious golf and wellness resort in Belek with a private beachfront, set in one of the most picturesque corners of the Turkish Riviera. Elegantly decorated in Seljuk style with perfect modern architecture, choose rooms where you can overlook either the turquoise blue waters of the Mediterranean or emerald green pine forests. 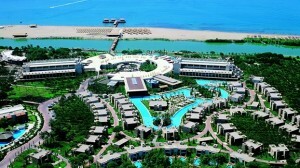 Maxx Royal Belek opened in June 2011, and has been designed with ultra luxury and maximum indulgence in mind. 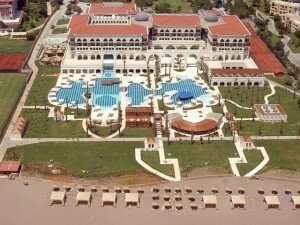 Maxx Royal Belek Golf & Spa is an all suite hotel, with 82 sq m rooms as standard. Sirene Belek Hotel is located perhaps in the most beautiful point of Belek Tourism Center which is recognized as the pupil of the Turkish Tourism and which makes us feel the magic of the coastal band. 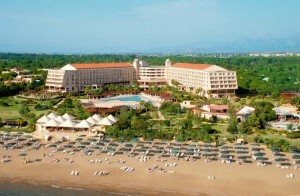 Sueno Deluxe Hotel is located on the beautiful coastline of Belek, directly next to the Sueno Golf Club. The hotel is a top destination for golfers. 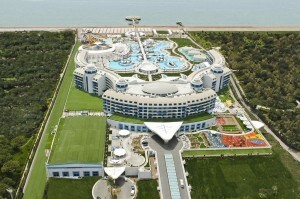 Sueno Hotels Deluxe Belek offers top class facilities in a great location. Titanic Deluxe Hotel is Situated by the river among pine forests. The hotel has an architecture well-matched with the nature, a golf course with 27 holes, rooms with unique views an elegant and also warm atmosphere.